Summary: Chicago, 1941. When her mother becomes too ill to work, fifteen-year-old Ruby Jacinski is forced to drop out of school to support her family. But her dull factory job makes life feel like one long dead end, until she meets neighborhood bad boy Paulie Suelze. Soon Ruby discovers how to make money -- lots of money -- while wearing silk and satin and doing what she does best: dancing. Paid ten cents a dance to lead lonely men around a dance hall floor, Ruby things she's finally found a way out of Chicago's tenements..until swinging with the hepcats turns into swimming with the sharks. A few weeks ago, Christine Fletcher e-mailed me asking if I'd like to read and review a copy of her latest book TEN CENTS A DANCE. She explained that it was published as a young adult novel, but many moms (like me!) have been providing a lot of positive feedback on the book as well. I haven't read more than a couple of young adult novels since I was a child; however, I have seen that many fellow bloggers thoroughly enjoy this genre, and I thought I should give one a try. It definitely helped that I thought the premise of the book looked extremely interesting. The book takes place in Chicago 1941 when Ruby was only 15 years old. As I started to read this book and get a grasp on the timeframe, it dawned on me that Ruby was born the same year as my grandmother. While my grandmother lived in a coal-mining town in rural PA and Ruby lived in a big city, they really had very little in common besides dropping out of school around the same time in their lives. For some strange reason though, I still kept thinking about my grandmother and how she had to go to work to help support her family like Ruby did -- it's so sad that both young girls were forced to grow up so fast. I thought this book was a very good read, and I didn't want to put it down once I got started. The character of Ruby just seemed so real to me. It was so interesting to see how she changed throughout the story and gained so much wisdom. At the beginning of the book, Ruby lied about her age so she could work in the dance hall. She quickly learned how to act older than her age, but I liked that there were still so many incidences where the reader could see her naivete and youth. What I found especially entertaining was despite Ruby's youth, she was still one tough cookie. I definitely think Ms. Fletcher captured the look and feel of the 1940s Chicago with her writing. It was evident to me that the author did a great deal of research while writing this book. I also found it very interesting how she got the inspiration for writing this story. In the author's notes, Ms. Fletcher explains how she had a great aunt who was disowned by her family at a young age for unknown reasons. Many years later, Ms. Fletcher's mother met the aunt she never knew existed and found out she was married to a cabdriver and lived in a nice apartment. It was extremely surprising when she died and they found out that she had been living a double life -- in reality, she was a taxi dancer and long-time mistress of a Jewish gangster. I do think that this book would make an excellent choice for a mother-daughter book club. There are so many wonderful discussion topics such as deception, family relations, friendships, first love, and finding one's self to name a few. I suggest this book be read by older teenagers since there are some subject matters that are definitely for more mature readers. I will be certain to keep this in mind for a future (in about six years or so) book for our group. I'm hoping that in the meantime, someone will come up with some thought-provoking discussion questions - hint, hint....In the meantime, I will certainly recommend this book to some of my mom friends. 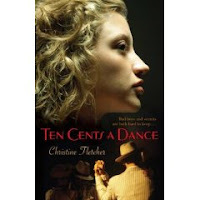 NOTE: After reading this post, Christine Fletcher, author of TEN CENTS A DANCE, graciously sent me some discussion questions that she wrote herself. I have posted them here. This one sounds really good. Sounds like a fascinating era to read about. This sounds like one for the wis! Ohh-I want to go read this one now!